​Over the years as apart of the National Charity League - Stanford Hills Chapter, all of us have had amazing experiences helping different philanthropies through our service work. Going into our senior year, we had the opportunity to choose one organization that we felt we could make a lasting impression on through our Senior Project. After a period of research and decision making, we all chose the Ecumenical Hunger Program in East Palo Alto, and to be honest, it was an easy decision for everyone. All of us had fond memories working with EHP over the years through assisting with the Food Pantry and Community Closet, helping kids with back-to-school supplies, supporting events such as Fun Fridays during the summer, and organizing the annual Blockfest and Christmas party celebrations. We enjoyed watching the devoted EHP staff bring joy and support to the local community and we appreciated the impact we were able to make with the children and families in the area. After speaking with the EHP staff in the spring of 2017 about helping to promote the program's message to its patrons, we came up with the idea to visually represent EHP's mission and add some life to the facility. A couple of girls in our class [Francesca Fallow and Ella Milliken] designed murals that would help illustrate EHP's bond and NCL's commitment to the local community. One, which sits next to the Food Pantry entrance, features paintings of all of the nutritious food that EHP offers, alongside the program's motto "EHP Cares" and painted handprints from community members. We believe this represents the community coming together over a common goal of healthy eating and helping each other strive towards this with EHP's continuous aide. The second mural we designed highlights the diverse community that EHP supports, including seniors, single mothers, children, the disabled, and families of all sizes and from all ethnic backgrounds. This 14-foot mural is beautiful with colorful California poppies representing everyone's home and a bright sky/sun with silhouettes of people holding hands in unity, which signifies the community moving together towards a brighter future. Our senior class loved painting these murals and we hope that they bring the same amount of joy to the EHP families as they did to us while we created them. We were extremely fortunate to have worked with a fantastic team from Habitat for Humanity, who seamlessly took on the job of mounting the murals to the building. We can't thank them enough: John Schniedwind, Dale Real, Keith Radher, Bill Olsen, and Dave Mans. 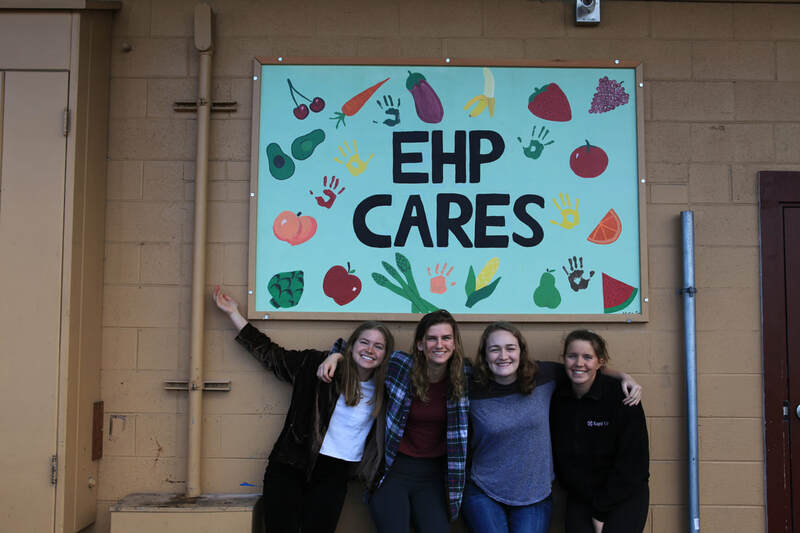 Even though we're all graduating from high school now and our time at the National Charity League has come to end, we're proud that the murals will be our class legacy to reinforce all the great work that is done through NCL with EHP. We hope that these bright murals will bring hope and joy to the members of the community and to let everyone know that they are always supported by the amazing program, EHP. 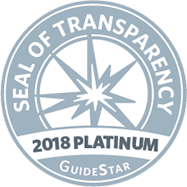 "​I’ve been aware of EHP for many years, but only joined the volunteer team recently when a friend recruited me to help out. I’m so impressed by the work that EHP does and I’m very happy that I can be a part of it. I love working for an organization that’s so community focused. It’s all about neighbors working together to help neighbors." "I’ve been working in the Community Closet, helping to sort and organize clothes so that clients can find what they need. My favorite job is making up layettes: a gift basket filled with essentials for families expecting a new child. We try to put together a package that will be both practical and fun for the families as they bring their new baby home." EHP is grateful for volunteers like Anne Johnson who bring joy to many families in need in the local community. Thank you Anne! Thanks goes out to this amazing group of volunteers from Grace Lutheran Church! EHP is nothing without its volunteers! ​On May 6th, friends and supporters of EHP met at the home of the Dunwoody family to gather together and raise funds for the amazing work happening at EHP. The event was a garden party theme, planned by board secretary Regan Dunwoody, and served as the perfect start to summer and a wonderful venue to support an important cause. "I just wanted to say thank you for the ample and tasty lunch provided by the ehp staff for volunteers today. It was a great opportunity to get to know more of you, since I haven’t been volunteering very long. But more than that, I want you to know that I look forward each week to the warm and friendly atmosphere you and all the staff create as we work together. It’s fun to be with you, and I know that my small efforts are appreciated each time I come. You, Florence, Teresa, Jasmine, Lea, Dede and all the staff I come in contact with embody the loving spirit of ehp and the dedication to improving people’s lives. May you continue to grow and thrive!" Malaina Kapoor, a student at Khan Academy Lab School in Mountain View, started the Culinary Collective cooking class in March of 2015. In her efforts to eradicate hunger, she is teaching youth how to prepare nutritionally balanced meals. While EHP has allowed the group to use the kitchen and the pots, Malaina has fundraised to supply the meals for the program. EHP would like thank TA Associates for their efforts in painting EHP’s Administrative Building and Program Building. From planning to execution, Ashu and Sharon worked alongside EHP staff to ensure that the project would be a success. It was amazing to watch the dedication and efforts the group put in to the project. It was hard work, but they completed the project with smiles. Carolyn Beckner first came to EHP 20 years ago to deliver a donation of food at Christmas. She was impressed witnessing Lesia Preston giving care to each family as they picked up children’s holiday gifts. Lesia accepted Carolyn’s donation with such a warm “Thank you!” that she decided on the spot that she wanted to do more. She asked her husband to donate what he would spend on a Christmas gift for her directly to EHP. When she brought in that check she met Nevida Butler and received a warm hug. With the support of her husband of fifty years, Carolyn has continued to donate her time and her Christmas money to EHP ever since. She says she returns month after month, year after year, because of the warm hugs and the blessing she feels. Now that she is retired, she doesn’t miss a week of helping in the clothing appointment closet. She is in awe of the hard work she sees the staff doing every day. Carolyn loves working together with the staff at EHP to give to the community. 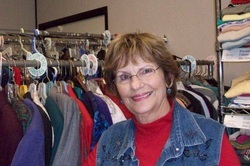 With a smile she says again, “Did I mention I love the staff?” In the clothing closet she especially enjoys the humor and stories from elderly women who come to pick out dresses for church. She refers to them as her “sugar plums and sweetie pies.” The first ever Community BlockFest held at EHP on September 25th was a highlight of the year for Carolyn. No matter what the life circumstances of the over 300 people in attendance (individuals, families, staff, donors, volunteers) they all enjoyed moving to the beat of the lively music contributed by several local musicians. Carolyn can’t wait for the 2ndannual BlockFest next year! Erica’s father taught her about gardening when she was very young. In addition to growing a wide variety of fruits and vegetables, he canned his own peaches, pickles, and bell peppers, and was an amazing cook. He has served as a role model for her growing up. Since then, she has had a garden everywhere she has lived, and she also enjoys cooking. She began searching for a gardening volunteer opportunity after discovering Alice Waters, the inspiring chef and founder of the Edible Schoolyard in Berkeley. She wanted to channel her passion toward a cause that she strongly believes in, which is how she found the Ecumenical Hunger Program. In June 2009, she took on the responsibility of starting the summer garden at EHP. 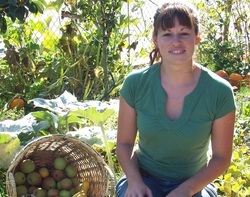 Erica said that growing produce at EHP has been the most enlightening experience of her life. After working in the garden for a few hours, she fills up a cart with everything that she has harvested, and distributes it to participants. “It is hard to explain the joy that I feel giving families the fruits and vegetables that I have grown.” Part of Erica’s time is also spent teaching children at EHP how to garden and compost, and letting them taste the many fruits, vegetables, and herbs that are being grown. Through this experience, Erica has developed a deep sense of compassion and urgency toward ensuring that all people receive basic necessities. This relates to and supports her quest to become a physician. “I believe that education on gardening and nutritious eating supports a healthier lifestyle, and thus contributes to the prevention of health problems such as obesity, diabetes and cardiovascular disease later in life,” she says. Erica is leaving EHP this summer and heading off to medical school in Michigan to fulfill her dream. She believes that EHP helped her get into med school, because during her interview she talked about her work at EHP and brought photos of the children and the garden. We will miss Erica tremendously and congratulate her on being selected as EHP’s 2010 Volunteer of the Year! ﻿When Sonia Sinton-Clark first came with her parents to volunteer at EHP at the age of four, she thought it was great fun. That was partly because her father would sing songs he made up about frozen turkeys, and the kids all loved it. Twenty-four years later, she still enjoys the experience, though for slightly different reasons. 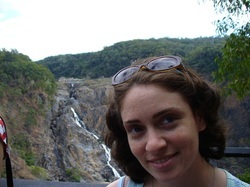 Sonia grew up in Palo Alto, the little sister of two older brothers. Her mother, Wendy Sinton, is the volunteer co-ordinator for the team from Congregation Beth Am who give many hours of service to EHP. Having graduated from San Jose State University, Sonia is now working towards a Master of Fine Arts degree at the University of Oregon in Eugene, Oregon. Being away from the area most of the year doesn't stop her volunteer activity with EHP: home for the Holidays in December, she spent time packing and delivering food boxes. So what is it that makes her turn out for EHP every year? “ I found out quite young that doing a small thing can make a real difference”, she says. “One of the things I remember very clearly from when I was a child is taking food boxes to seniors in the Runnymede Gardens Apartments, and seeing how happy it made them to have kids helping with the deliveries.” Working at the loading and distribution end of the process, she says, gave her a much clearer idea of what is needed and useful. When not packing food, Sonia and her brothers would help with the selection and bagging of toys. Now, when she sees a toy drive, she thinks not just of small children, but of what an older child or a teenager might want, like a hairdryer or a Walkman. When Sonia was a teenager, she inherited her grandmother's car, and drove it till she graduated from college and got a new one. Guess where that favorite old car went? To EHP, of course. “I still wonder about it, and kind of look out for it around town” she confesses. She likes to think that it's still on the road and of use to someone. Sonia thinks it's good to find out about volunteering when young. “Being in the volunteering habit makes it easier to see what's needed and help in many situations”, she says. It certainly worked for this young woman. A beloved part of the EHP family, James A. Henghold, passed away on November 9th, 2017. Jim spent many years on the EHP board, various committees and on the Friends of EHP. Generous to a fault, Jim not only donated his time and money but through Hengehold Trucks, he donated many of EHP's trucks and our passenger vans over the last two decades. We will greatly miss Jim's kind and generous spirit, his loving nature and his quirky sense of humor. Please click on the link to view Jim's full obituary. 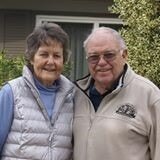 ​Bob Arrington, longtime friend and local GO Team leader for mission partners with Menlo Park Presbyterian Church, passed away on January 18, 2016. He will be greatly missed. We celebrate his ongoing legacy by the work we do at EHP. Our friend, longtime volunteer and donor, Mary Bourquin passed away on March 30, 2016. She was an extraordinary individual who made a significant impact on EHP through her compassion, generosity and unwavering commitment to EHP families and the local community. An EHP volunteer luncheon was held in her honor on April 26th, 2016. Mary's genuine spirit, thoughtfulness, graciousness and positive outlook on life will be greatly missed by everyone who was touched by her presence. 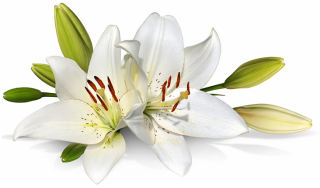 To view her obituary in the San Jose Mercury News, please click here. ​Special thanks to the Friends of EHP for donating the plaque and to our friends at non-profit Canopy for donating the lemon tree and trellis that is now planted on our campus as a memorial to long time beloved volunteer and supporter Mary Bourquin. While also improving the environment, this wonderful addition to the EHP campus will be enjoyed for many years to come! Canopy brings the life-giving benefits of trees to nonprofits, schools, neighborhoods, and public spaces all over the Mid-Peninsula. Gail LeBaron Reed, a long term resident of Woodside and Portola Valley, passed away at the age of 76 on May 31, 2017. While never a visible volunteer presence around and about the EHP campus during the Doll Project years, Gail made a serious commitment to raising funds for EHP by way of her talent as a seamstress, being a fabric maven, and most importantly as a revered member of the Christ Church, Portola Valley community who heeded her recommendations and advice about supporting and donating to EHP. The decision by her two sons to designate EHP for Gail's memorial recognition reflects their knowledge about what was near and dear to their mother's heart. Their shared knowledge warms my heart. Please click here for a link to her obituary. Charles Earl Simmons was born on February 24, 1944 to Mr. & Mrs. Johnnie Simmons in Magnolia, Mississippi. He was one eight siblings including four brothers and four sisters. He attended Central High School where he graduated in May of 1962 in Liberty, Mississippi. Chuck accepted Christ at an early age at Sherman Missionary Baptist Church in Magnolia, Mississippi. Charles, better known as “Chuck," moved to California in 1964. He met, fell in love and married Elaine Greer Simmons in 1981. Chuck was a Christian man who loved the Lord with all of his heart, mind and soul. He was very active in the Bay Area District Association Laymen's Ministry. He volunteered at various community charitable organizations. He was employed by the County of San Mateo for thirty-six years and retired in 2006. Chuck was an honest man with a big heart. He was a loving husband, step-father, son, brother, uncle and friend to many. 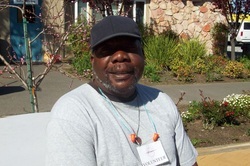 Chuck was a dedicated volunteer with EHP for over 10 years. He was an invaluable member of the EHP family and a constant fixture at the EHP campus. 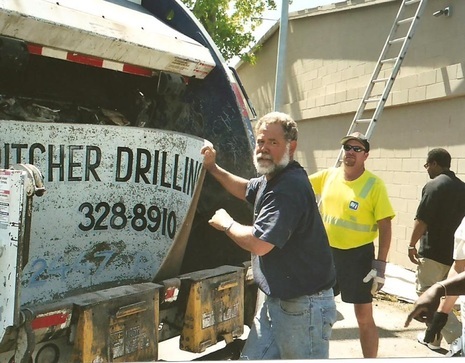 He took care of a multitude of different tasks including landscaping, assisting with the distributions, unloading donations, even taking out the trash when it was necessary. Chuck had an amazing work ethic, one that we all learned from. No matter how difficult the task, he would do it with a smile on his face. Chuck will truly be missed, not just for the time that he faithfully donated to the program but for his positive spirit and uplifting personality. We all grieve the loss of an amazing friend but we know that he finally receiving his just rewards from a life well lived.